IsaDora Holographic Nails: Glowing Beetle, Lilac De Luxe and Rocky Ruby - Polish This! Today I have some really gorgeous IsaDora polishes to show you guys! 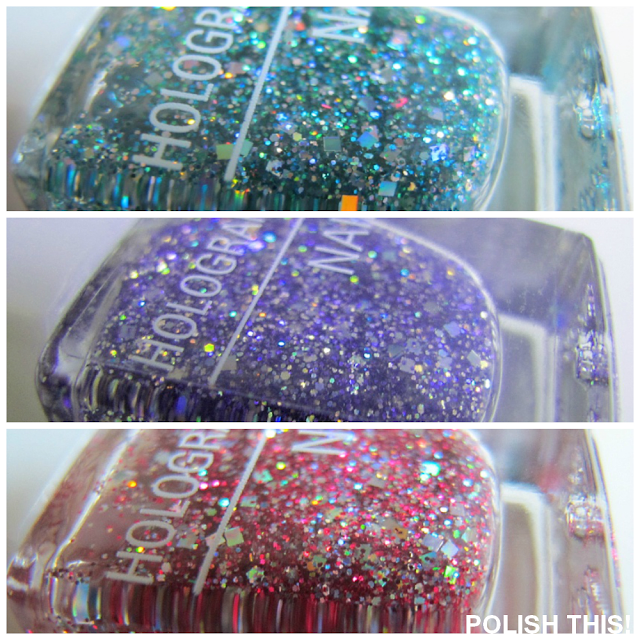 I got to choose three Holographic Nails polishes for review with the Peel Of Base, so today I'm showing you these three glitters and I'll do a separate review of that Peel Of Base later. I chose the three that interested me the most: Glowing Beetle, Lilac De Luxe and Rocky Ruby. 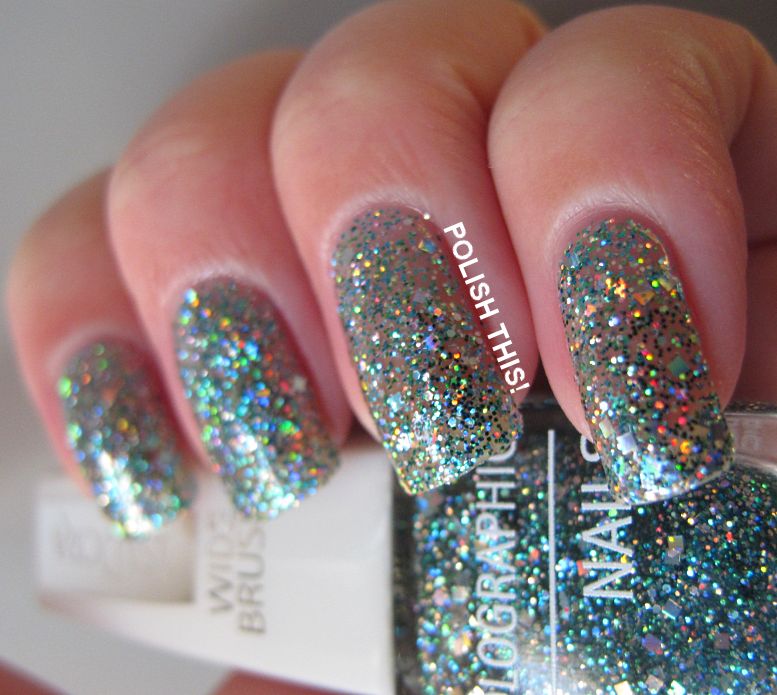 All these three look really gorgeous in the bottle, so very sparkly! These can be worn alone, but they work also really great as toppers. I decided first to show you them alone and I'll certainly do some manicures later where I'll be using these as toppers and for layering. I used three coats of each polish and that really gave a pretty nice coverage though they weren't still fully opaque. I don't have any base coat in these pictures, but I used some top coat to smooth out those glitters, though I have to say that these were surprisingly flat on their own too! First off is Glowing Beetle, gorgeous turquoise green with amazing holographic sparkle. This is really a gorgeous color! The sparkle in all of these three was a little bit impossible to catch on camera, so they are all really even more sparkly in real life. I'd almost say that out of these three the holographic sparkle and effect was the strongest in this one, but it's really quite hard to say as they all sparkle so beautifully. I already tried this layered too over IsaDora Pistacchio, but that wasn't really the best combo, so I'll need to figure out something else to layer this with. I do like it on it's own too, and I'm sure I'll find some great layering combos as well. The second one is Lilac De Luxe, dark blue toned purple with really gorgeous holographic sparkle too. I wasn't sure if I should choose this one or maybe one of those blue ones but I'm glad I decided to take this one as it is really gorgeous and it kinda looks almost like a blue one in some lighting. I have some layering ideas for this one too already, I'll need to try those out after Christmas! I have to say that I'm not usually the biggest fan of square glitters but in all these they really work nicely. And then the last one of these three is Rocky Ruby, a really gorgeous ruby red glitter with again that amazing holographic sparkle. 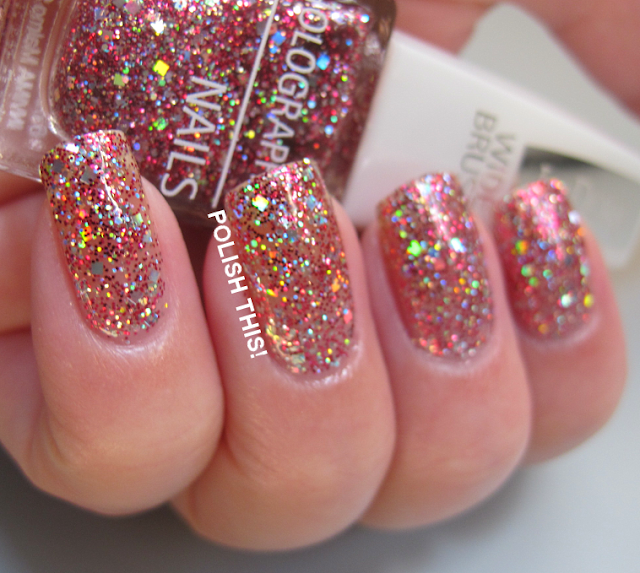 This would certainly be a perfect polish for somekind of Christmas manicure! I really loved the color of this on too and again, I can't wait to try this also with some other polishes! If I had to choose my favourite out of these three I'd might say that it's Rocky Ruby just slightly, but all these three are really so gorgeous and they are all perfect for the holidays too! I think it's also great that IsaDora did that Peel Of Base with these as the removal of these Holographic Nails polishes could be quite pain without it... But I'll do the review about that one later! So there's really a nice selection to choose from and if you are sparkle and holographic lover like I am, at least one of these is really a must have! Tänään esittelyssä IsaDoran Holographic Nails uutuuslakoista kolme: Glowing Beetle, Lilac De Luxe ja Rocky Ruby. Lakkasin kaikkia kolmea kynsille kolme kerrosta päällilakan kera, mutta nämä ovat tietysti myös loistavia lakkoja käytettäväksi toppereina ja muutenkin muiden lakkojen kanssa. Kaikki kolme kimmeltivät jo pulloissa ihanasti ja kynsillä kimallus oli todella kaunis, vaikkakin sitä oli varsin hankala saada vangittua kuviin mukaan. Kaikki kolme sävyä olivat todella nättejä, ehkä hienon hienosti näistä nousi suosikiksi Rocky Ruby. Kokoelmaan kuuluu yhteensä yhdeksän eri sävyä ja näiden kanssahan julkaistiin myös Peel Of Base, josta kirjoittelen arviota erikseen myöhemmin. Nämä ovat ehdottomasti täydellisiä lakkoja juhlakauteen ja näitä pitäisi löytyä jo kaupoista, joten kannattaa käydä kurkkimassa.